Chorwad: Amid speculation in distant Mumbai that they have buried their difference after six years of estrangement, brothers Mukesh and Anil Ambani are set to gather in Chorwad to dedicate a memorial to their late father and founder of India’s most valuable company Reliance Industries Ltd in his birthplace. Dhirubhai Ambani was born in Chorwad, located 400km from Ahmedabad, the principal city in Gujarat, on 28 December 1932. His death on 6 July 2002 was followed by a bitter feud between Mukesh and Anil Ambani that culminated in the division of the Reliance business empire between the two siblings. Under a 2005 agreement, older brother Mukesh retained the chemicals, oil and gas businesses along with the group flagship, Reliance Industries Ltd. Anil took control of the group’s newer businesses including telecom, power and financial services. The two brothers, who agreed not to step into each other’s turf, have been locked in various disputes since then. In May 2010, the estranged brothers signed an accord that allowed them to compete against each other, a move that they said will promote “harmony, co-operation and collaboration between the two groups." After that tentative truce, the brothers are working perhaps for the first time together—to fulfil the dream of their mother to convert the house where Dhirubhai Ambani spent his formative years, before moving to Aden in Yemen, where he worked at an oil company, into a memorial. “My grandmother had acted as a match-maker for Dhirubhai and Kokilaben’s wedding. It was Dhirubhai’s dream to own the house where he once spent his childhood," said Damani. “After his untimely demise, Kokilaben took this whole project in her hand. She wanted the entire family to remain present during the inaugural ceremony." “The entire family with about 150 odd members including the family of Mukesh and Anil Ambani will be present. There are no differences today between the brothers," said Damani. Damani echoes the sentiments of thousands of well-wishers of the Ambani family in Chorwad and neighbouring Kukaswada village. Hareshbhai Kanabar, while turning a leaf of an old photo album which has pictures of his family sharing some moments with the Ambanis in 1995, says he has received an oral invitation from Kokilaben’s office and is eagerly awaiting the arrival of the Ambani family. Kanabar, who was a neighbour of the Ambani family in Kukaswada, 5km from Chorwad, recalls how Dhirubhai had sent a panel of doctors to oversee his thalassemia treatment in a Mumbai hospital. Madhubhai Shah, who journeyed 900km on foot to Shrinathji temple at Nathdwara in Rajasthan in 2005 to pray for the brothers, says the news of the family coming together has made him a happy man. The last time the entire Ambani family was in Chorwad was way back in 1995 when Dhirubhai had invited close to 40,000 people for lunch. “We are aware that the Ambanis have planned a programme at Chorwad where they have their ancestral house which they have converted into a memorial and they intend to open it to public this year end," according to A.M. Parmar, collector of Junagadh district. The Ambanis have left their mark on the town, be it on the gate at the entrance, setting up educational institutes, the Aden Street, providing drinking water facilities or a hospital in the vicinity. There are however, some others who feel that the Ambanis could do more for the development of Chorwad. The town is largely composed of poor people who are daily wage earners. With a population of 35,000, the town is dominated by the Koli community which is mainly into farming, followed by the Kharva community, which makes a living through fishing. The memorial, whose opening coincides with the birth anniversary of Dhirubhai, resembles an oasis in a desert. 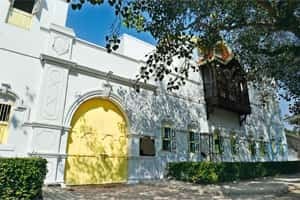 Spread in an area of one acre, the memorial houses a photo gallery with archives of photographs showcasing Dhirubhai’s life journey, which has already become a part of business folklore. A part of the house is being renovated in such a way that its original structure remains intact. The other part is being converted into a museum. “In the industrial history of the world, no person has achieved this big a success in such a short span as Dhirubhai Ambani. He was almost a non-entity till 1970," said Dwijendra Tripathi, a business historian and the author of The Oxford History of Indian Business. “Despite Dhirubhai’s meagre education or his poor family background, Reliance was number one company in the Indian corporate world by the time of his demise." The famous ‘Dhirubhai Chair’, reminiscent of the one popularised in Francis Ford Cappola’s Godfather trilogy and from which the Indian business tycoon said he “drew energy" will also be on display at the museum, said a person with knowledge of the matter. The person didn’t want to be named. Final touches are being given to a private helipad located at a distance of not more than 2km from the memorial for the Ambanis to land in their private aircraft. Official spokespersons from the Mukesh Ambani-led Reliance Industries and Anil Ambani-led Reliance Group declined to comment as it was a “family" affair. “The building has been renovated at an estimated cost of ₹ 4-5 crore. There is a small theatre for showcasing a documentary made on the life of Dhirubhai. Kokilaben has been personally monitoring the entire process as this project has been close to her heart," said Divyesh Pathak, a local community leader based in Chorwad. Pathak also works as a freelance journalist with television channels. Kokilaben has been regularly visiting the house for the past one month, Pathak said. Dhirubhai’s father Hirachand was a village school teacher in Chorwad and he had a house and some real estate in Kukaswada, which he later sold in the early 1950s. The family stayed in a rented house in Chorwad. In 2002, the Ambanis bought the house from Bharatbhai Sheth, whose family owned it, for an undisclosed amount. Hirabhai Chudasama, who has been the chairman of the local municipal body for the last 37 years, says that the town had been facing a water crisis and Dhirubhai provided them with drinking water for many years. “Every year he would spend about ₹ 50 lakh only to provide water to us. He once told me that he would also go to the extent of giving us water from his Jamnagar refinery to keep us from being thirsty," said Chudasama, who belongs to the Bharatiya Janata Party. Dhirubhai even provided employment to thousands of local youth at his textile factory in Ahmedabad, he says, adding that 87% of the town’s population consisted of the poor and many still sleep on empty stomachs. “We will be spending about ₹ 4-5 lakh to welcome the Ambani family and give them our blessings. After all, their father has done a lot for the villagers," Chudasama said.